Samuel Pepys lived during a very exciting time for many scientific fields, and mathematics was no exception. Consider that Isaac Newton, one of the giants in the field, was a contemporary and compatriot of Pepys, and you’ll get an idea of the strides being made at the time, as Classical scientific and mathematical concepts that had held sway for many centuries were being challenged and swept away. Besides Newton, other notable English mathematicians of the time included Robert Boyle, John Collins, Jonas Moore, and John Wallis, all of whom Pepys knew through their association with The Royal Society (Pepys was president from 1684 to 1686). Sam’s education, which was classically Classical in nature, did not focus on mathematics beyond the simplest of concepts. Though he was well able to keep his own and his lord’s accounts, it wasn’t until he entered the Navy Office that he realized he needed to learn higher forms of math, and so began receiving instruction from one-eyed, hard-drinking sailing master Richard Cooper, being introduced to the multiplication tables by him on 4 July 1662. The knowledge he gained from Cooper, combined with the knowledge gained from master shipbuilder Anthony Deane in measuring timber, enabled Sam to ferret out corruption and serve Charles II well. The Diary entry of 7 August 1663 is a good example of Sam flexing his new-found skills and tools. Early in the Diary, after bringing the King back from Holland, Sam tells of a seaside ride with Edward “My Lord” Montagu and several companions during which the group laid wagers on the height of “a very high cliff by the sea-side.” Montagu “made a pretty good measure of it with two sticks, and found it to be not above thirty-five yards high,” losing the wager for himself, and winning it for Pepys, who had said the cliff was not as tall as St. Paul’s Cathedral, which Pepys said was “reckoned to be about ninety” yards high. How was Montagu able to do this without the aid of the modern devices we normally use for such tasks? Grahamt has a good explanation of it here. The need to measure things accurately pops up again and again in the Diary, including the entry of 9 June 1663, where Pepys recalls a conversation with friendly rival John Creed about “a way found out by Mr. Jonas Moore” called “duodecimall arithmetique, which is properly applied to measuring, where all is ordered by inches, which are 12 in a foot, which I have a mind to learn.” This system of measuring things by twelves rather than tens (as in the decimal system) solved many problems in a system dominated by 12 inches to a foot. More on the duodecimal system can be found here. Even more discussion on the system, as well as information about other mathematical figures (ahem) and concepts covered thus far in the Diary, can be found below. Collins( 1624-1683) also held a position as an accountant in the Excise Office from 1668 to 1670. However times were not easy and Collins only received a small fraction of his proper salary from the Council of Plantations. He therefore resigned in September 1672 and was given job in the Farthing Office. The Farthing Office was a part of the Mint and Charles II had introduced, in 1672, the copper half-penny and farthing with the Britannia type. John Wallis was a very important mathematician of this era. Newton cited him as an influence. Although Wallis was a Parliamentarian he spoke out against the execution of Charles I and, in 1648, had signed a petition against the King's execution. In 1660 when the monarchy was restored and Charles II came to the throne, Wallis had his appointment in the Savilian Chair confirmed by the King. Charles II went even further for he appointed Wallis as a royal chaplain and, in 1661, nominated him as a member of a committee set up to revise the prayer book. Today, his legacy is the common symbol for infinity, (like an 8 on its side) which he introduced in 1655 in his books "Tract on Conic Sections" and "Arithmetica infinitorum". "Wallis contributed substantially to the origins of calculus and was the most influential English mathematician before Newton" according to the above site. "Dugdale give the height of the tower as 260 ft - Evelyn used it as a measure of the height of a precipice in the Alps - The spire, taken down in 1561, had been an additional 274 ft."
I am not a mathematician nor surveyor. I worked this out from first principals using geometry I learned 40+ years ago. It is not rocket science. Also from L&M: "The peak of Tenerife (in the Canaries: 12,162 ft) was often reckoned the highest in the world. On 2 January the 'Royal Society' had arranged to enquire about air pressure on the mountain. Nothing seems to be known of any visit by Ralph Greatorex." I found Greatorex ... discoursing of many things in mathematics, and among others he showed me how it comes to pass the strength that levers have, and he showed me that what is got as to matter of strength is lost by them as to matter of time. click to expand the red stripe tp full size; but this full-length one reads less clearly than the last. "....John Napier (1550-1617), the inventor of logarithms, in his 1614 work on logarithms, Mirifici logarithmorum canonis descriptio,...."
"....the second edition of Edward Wright's translation of Napier's Descripto (London, 1618), in an appendix probably written by William Oughtred (1574-1660) ,..."
"...Clavis Mathematicae (Key to Mathematics, 1628/1631). ..."
Why twelth's; there be the stars,the hours, musical scales, inches to the foot,ozs to the pound, pennies to the shilling. Tenths got a bad rap as the there be the tythes which be a tenth of the annual income or otherwise more than one month's worth [5 weeks and 2 days and a bit ] of the yearly income. 10 be too easy to use, it be harder to use 12ths in order to short change the peasant as he could not use his toes for the remainders. 1712 J. JAMES tr. Le Blond's Gardening 197 Five Twelfths of an Inch thick. 1792 A. YOUNG Trav. France 537 No such thing was ever known in any part of France..as a tenth: it was always a twelfth, or a thirteenth, or even a twentieth of the produce. When did Decimal/ tenths become the norm for the Continent? Linguistically speaking, most (not all) of the world's languages are decimal, in the sense that they have root words for one through ten, and then form higher numbers by combinations of these roots (in Chinese, for example, 'eleven' is simply "ten-one", 'twelve' is "ten-two", etc.) Most of the Indo-European languages are the same: Italian "undici" is clearly "one-ten", Russian 'eleven' is "one-on-ten", etc. French and Spanish "onze, douze," "once, doce" show more modification, but their "one, two" components are clear enough. In the Germanic languages, however, including English, the situation is a little different. The internal structure of "eleven" and "twelve" (and their counterparts in other Germanic languages) don't include any form of "ten", and "eleven" doesn't even have a "one" in its modern form (although historically it did). The OED suggests that the "l-v" component of these words comes from the same source as "leave", and the original sense was something like "count to ten, one (or two) left over." But in the modern language we don't get to a clear compound form until "thirteen," so for English (and German, and Dutch) speakers today, "eleven" and "twelve" are really root forms, which would make the number systems of those languages duodecimal rather than decimal. However, that's only true for the lowest numbers; by the time we get to twenty, we're in clear decimal mode all the rest of the way. Paul be linguistic correct, but decimal thinking for calculating the deci-s this and that would be applied later, mathematically. Was it not until the French Acadamy of Science that forced the changes later in 1700's? To apply simple decimal maths to all calculations except in the case of the astrological [magicians]types, was not accepted it until it be done at the behance of removing the 'let there be cake eater' and her Allies. My memory says that it be the Corsican that showed the way. The MKS standards of measures: bars that were rigid, weights that did not evaporate, rods that did not shrink. Need to Know in which year when a kilo of *** be the market standard? 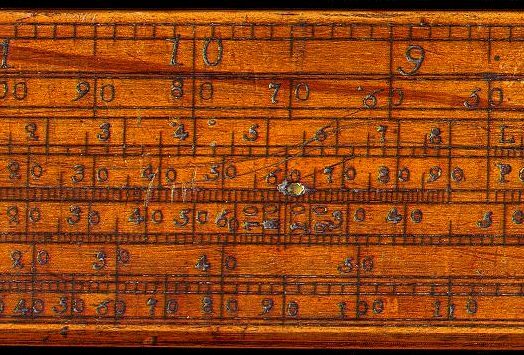 By the 18th century, dozens of different units of measurement were commonly used throughout the world. Length, for example, could be measured in feet, inches, miles, spans, cubits, hands, furlongs, palms, rods, chains, leagues and more. The lack of common standards led to a lot of confusion and significant inefficiencies in trade between countries. In 1790, the French National Assembly commissioned the Academy of Science to design a simple, decimal-based system of units; the system they devised is known as the metric system. Here be the potty French numbers and words before the guillotine chopped them up. Before the metric system, the French unit of length was the toise, which is about 1949 mm. The toise was divided into 6 Paris feet, each of which was divided into 12 pouces, that were further subdivided into 12 lignes. The use of 'Paris' to modify the foot suggests that there were other feet, and there were. 1949mm = 76.3" = 6'4"
Airline seat = free cubed Cubit: found that the Airlines gives a space of 1 cubit wide x 1 cubit [seat] et 1 hand x 11 pouces high. His name is spelled "Isaac Newton." Arguably the first optical engineer. Whilst some measurements and counting in English come from French, it is a delightful fact that the French cannot count above soixante-neuf = 69 (which may explain its rude use by the vulgar amongst you, but never I think used by Sam). All numbers above 69 rely on combinations of "sixty" (soixante-dix = 60 + 10 = 70, soixante-quinze = 60 + 15 = 75, etc), or "eight" (quatre-vingts = 4 x 20 = 80, quatre-vingts-quinze = 4 x 20, + 15 = 95, etc). Whilst it is useful to remind the French of this when they are being more than usually irritating, does anybody know why their counting has never developed further, unlike the Belgians (and I think the French Swiss?) who logically use septante = 70 and nonante = 90? Being necessary and usefull, For Astronomers. Engineres. Geographers. Architecks. Land-meaters. Carpenters. Sea-men. Paynters. Carvers, &c.
Written in Latine by Peter Ramvs, and now Translated and much enlarged by the Learned Mr. William Bedwell. William Leybourn (1626-1716) was an English "mathematican and land surveyor" who wrote extensively on elementary and practical mathematics. He wrote the kind of books that Sam might have been interested in, though Leybourn is never mentioned in the diary. He is mentioned by a number of annotators though. Many of his works are available as reprints. Arithmetick, vulgar, decimal, instrumental, algebraical. see CHAPTER SEVEN	JAMES I — 1567 TO 1625. "Considerable progress at this period was made in the science of navigation. In 1624 Mr. Gunter, professor of astronomy at Gresham College, Cambridge, published his scale of logarithms, sines, etc., and invented the scale which has since gone by his name."